A Bahraini court on Wednesday jailed 29 people, including an award winning photographer, for up to 10 years for an alleged attack on a police center in April 2012. A judicial source and activists said the verdicts were based on defendants’ confessions that were extracted under torture. Twenty-six of those convicted were handed 10-year prison terms and three others jailed for three years, a source told AFP. Among those sentenced to 10 years was Ahmed Humaidan, a 26-year-old photojournalist abducted by plainclothes police in late-2012. Humaidan’s lawyer said the court presented no evidence to suggest that he was involved in any attack against police aside from a confession he made under torture. The Bahrain Center for Human Rights has documented cases of torture against the young photojournalist in prison, which included being blind-folded and told to hold an object for hours that police claimed was a bomb. The prosecution accused the defendants of attacking a police center in the village of Sitra, south of Manama, with petrol bombs and iron rods, wounding a policeman. The other defendants also told the court that they were tortured and their confessions obtained under duress, according to the judicial source. Bahrain, home to the US Fifth Fleet, remains in a constant state of turmoil since authorities launched a bloody crackdown on a popular uprising three years ago, with hundreds of protesters and activists jailed on “terror” charges. Authorities in the Gulf dictatorship last year increased the penalties for those convicted of violence, introducing the death penalty or life sentences in certain cases. Israeli occupation forces who shot dead a Palestinian teenager in the West Bank last week used live fire, without warning, against innocent youngsters out foraging for roots, an Israeli rights group said Wednesday. After investigating the March 19 death of 15-year-old Yussef Sami Shawamreh, B’Tselem said it had found no evidence to support the army’s version of events that troops had opened fire at youths who had “sabotaged” the West Bank apartheid wall. 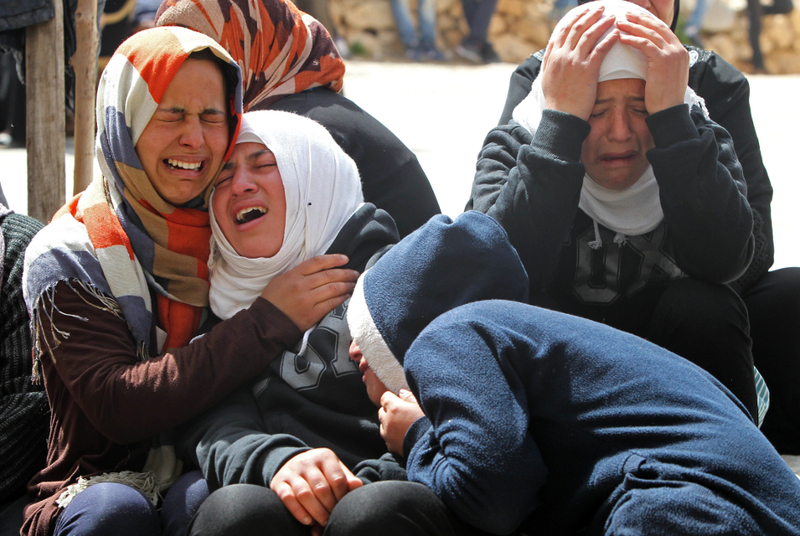 B’Tselem said the primary responsibility for the boy’s death rested with the army commanders who approved the use of live fire at a site where villagers from Deir al-Asal al-Tahta are known to go out and pick wild plants on their own land. An army spokeswoman told AFP after the incident that soldiers had spotted three Palestinians vandalizing the wall, saying they had “verbally warned” them before firing warning shots in the air then shooting at their lower extremities. But Shawamreh’s family and witnesses said the teenager had been looking for gundelia, a thistle-type plant used in cooking. B’Tselem said the shooting occurred in an area where there is a wide breach in the barrier and where families regularly go out to forage on their own farmland. “The two surviving youths… heard three or four shots as they got off the road, fired with no advance warning,” the report said. Shawamreh, who was severely wounded but not picked up by a military ambulance for some 30 minutes, was later pronounced dead at an Israeli hospital. The NGO said its findings were “markedly different” from the army’s version of events. “The youths made no attempt at vandalism; they were crossing through a long-existing breach, and the soldiers did not carry out suspect arrest procedure, shooting at Shawamreh with no advance warning,” it said. Troops in the area were “well aware” that over the past two years, Palestinians have been crossing the barrier at the breach “to pick gundelia on their own farmland,” B’Tselem. Two days earlier, soldiers had detained four teenagers in the same spot, beating them and confiscating the plants they had picked. “The decision to mount an armed ambush at a point in the barrier known to be crossed by youths, who pose no danger whatsoever to anyone, for the purpose of harvesting plants is highly questionable,” the report said, noting it showed “extremely faulty discretion” on the part of the commanders. “The primary responsibility for the killing lies with the commanders who sent the soldiers out on armed ambush,” B’Tselem director Jessica Montell said in a statement that urged the military police to consider whether the commanders should “bear personal criminal responsibility” for Shawamreh’s death. There was no immediate response from the occupation authorities. Bring us your nerve gases, your blister agents, your horrible weapons of warfare, your wretched refuse of World War II… This about sums up the decision of leaders in Washington after World War II when it came time for the American military to dispose of its arsenal of chemical weapons and those belonging to both the countries it fought against and alongside. After the war’s conclusion, the U.S. government buried thousands of munitions loaded with chemical agents all across the country. These weapons of mass destruction were part of the U.S. arsenal as well as those belonging to ally Britain and enemies Germany and Japan. The bombs and containers were simply dumped in the ground and buried, without concern for long-term environmental and health consequences. Alabama is home to the largest of 249 such sites that are located in 40 states. Redstone Arsenal, a longtime U.S. Army base, sits atop miles of hidden trenches containing blister agents, choking agents, blood agents and more. The 38,000-acre base is surrounded by homes, schools, churches and shopping centers—a city of 200,000 people. It was reported that few residents are aware of the toxic danger lurking nearby. A disposal team has been working at Redstone since the 1970s trying to locate all of the chemical weaponry that is buried beneath 17 six-mile-long trenches. Once those trenches have all been located, the next step—scheduled to begin in 2019—is to remove the bombs and containers with great care, due to the uncertainty of the weapons’ condition after being held deep underground for decades. No more than six munitions can be safely removed each day. Redstone’s cleanup is expected to take until at least 2042. The quantity of weapons: 388,000. Between 20,000 and 25,000 of these are intact and, once disturbed, may be volatile. Alabama has a second site, at former Camp Sibert (pdf) near Huntsville, with at least 13 stockpiles of mustard and phosgene gas. Another of these sites is located in Spring Valley, Virginia, not far from the White House. Its arsenal features even older chemical munitions—possibly including mustard and arsenic—manufactured during World War I. Several years ago, a vast supply of munitions from World War II was discovered beneath the grounds of Odyssey Middle School in Orlando, Florida. One of the weapons ignited into flames, but didn’t explode, injuring an Army Corps of Engineers contractor attempting to remove it. More than 200 potentially volatile explosives were found, most under the school and some near homes in the surrounding neighborhood. Home values, which were originally in the $600,000 range, plunged by at least 30%, while banks told homeowners their residences were worthless to lend against. The U.S. military also dumped a huge volume of chemical weapons off both the Atlantic and Pacific coasts. There are no plans to clean up those sites, although Congress has authorized studies to look into it. In 1958, about a hundred miles offshore of California, the SS William Ralston—loaded with more than 300,000 mustard gas bombs and 1,500 one-ton containers of Lewisite, a blistering agent—was scuttled by the U.S military. To this day it sits beneath nearly 14,000 feet of water just outside of San Francisco. This week the UN celebrated World Water Day – a day to remember the billion people who are unable to meet their needs for safe, clean water due to drought, poverty and official neglect. But it’s also a day to remember, and fight for, 2.1 million Palestinians who suffer something different – an artificial water scarcity deliberately created and sustained by Israel’s military occupation, and the private Israeli water company Mekorot. Increased international pressure brings hope that the tide may be finally turning for Palestinians striving for water justice in the West Bank and Gaza – in particular, recent investment and partnership decisions against Mekarot, which runs Israel’s discriminatory water policy in the West Bank. The situation in Gaza is especially dire. The tiny, densely populated territory relies entirely on its depleted, saltwater-contaminated and sewage-polluted aquifer, and the water it produces is unfit for consumption. Water has to be bought, expensively, in bottles or from mobile tanks. Moreover restrictions on fuel imports mean that Gaza’s single power station spends most of its time idle – and so long as it’s not running water and sewage cannot be pumped. So the taps are dry, toilets are blocked, and sewage pollution gets worse. Not that Palestinian residents of East Jerusalem have it a lot better. As reported on 17th March, the city suffered a long water cut beginning on 4th March leaving Ras Shehada, Ras Khamis, Dahyat A’salam and the Shuafat refugee camp – cut off from the rest of the city by the separation wall – with no running water. The reason is simple – old and inadequate water infrastructure, which there are no plans to improve or renew. For West Bank as a whole the facts speak for themselves. The Oslo II Accords dealt Palestinians a singularly poor hand – limiting the volume of water it could produce, as well as imposing severe restrictions on the development and maintenance of Palestinian water infrastructure. The Accords allow Palestinians to abstract only 118 million cubic meters (mcm) per year from boreholes, wells, springs and precipitation in the West Bank. But Israel is allowed to take four times as much – 483 mcm per year – from the same Palestinian resources. So not only does Israel now occupy 80% of the area of historic Palestine, but it – via the water company Mekarot – also takes 80% of the water resources from the 20% of the land that is left to the Palestinians. But it gets worse. Oslo II’s draconian restrictions on water development imposed by Israel mean that Palestinians can only actually abstract 87 mcm in the West Bank, of the 118 mcm they are allowed. The acute water deficit is made up by the supply of piped water from Israel. Mekarot currently sells the Palestinian Water Authority some 60 mcm per year – at full price. As reported by Amira Hass in Ha’aretz, “in that agreement Israel imposed a scandalously uneven, humiliating and infuriating division of the water resources”. While Palestinian water is piped into Israel at no cost, a fraction of it is then piped back again, and paid for. In this way Israel is extracting from Palestinians both their water, and their money. In some cases Palestinians are forced to pay ten times more for their water than the price in Tel Aviv – as in the village of Sussia on South Mount Hebron, where they have to drive to the nearby town to buy over-priced water (see photo), even though a water main passes directly through the village on its way to an Israeli settlement. According to the UN Human Rights Council, this all translates into a wide disparity between water use by Palestinians and by settlers in the West Bank. Settlers enjoy 400 litres per capita per day (l/c/d) while some Palestinians survive on a little as 10 l/c/d. “Settlements benefit from enough water to run farms and orchards, and for swimming pools and spas, while Palestinians often struggle to access the minimum water requirements. These very low levels of water provision fail to meet the water needs of many Palestinian communities – leaving them with often contaminated water, and not enough of it. While Palestinian water use may just exceed 70 l/c/d in the relatively well served urban centers of the West Bank, it drops much lower in rural areas that have no access to piped water and depend on wells and rainwater collection. An estimated 113,000 Palestinians in the West Bank have no piped water supply, while hundreds of thousands more have only intermittent supply, especially in the summer. The restrictions and limitations imposed on Palestinians to access their own resources and develop them have exacerbated the already severe water shortages among Palestinian communities. In ‘Area C’, which covers 60% of the area of the West Bank, Palestinian farmers and communities are not allowed to connect to the water network that serves the growing settlements – and are forbidden even to dig out cisterns. The international community considers the establishment of Israeli settlements in the Israeli-occupied territories illegal under international law, as set out in the report of the fact finding mission of the United Nations Office of the High Commissioner for Human Rights. Yet the construction of new illegal Israeli settlements and ‘outposts’, and the expansion of existing ones, is proceeding apace – and further reducing the quantity of water allocated to Palestinians. Violence and destruction may also come directly from the occupation authorities. “Destruction of water infrastructure, including rainwater cisterns, by Israeli authorities has increased since the beginning of 2010; double in 2012 compared to 2011. “The denial of water is used to trigger displacement, particularly in areas slated for settlement expansion, especially since these communities are mostly farmers and herders who depend on water for their livelihoods. All Israeli settlements in the West Bank are connected to piped water supplied by Israeli water company Mekorot, which took over responsibility for the water resources of the West Bank from the occupying forces in 1982. Thus it Mekarot which is both the on-the-ground enforcer, and the economic beneficiary, of the West Bank’s ‘water apartheid’. “The lack of availability of Palestinian water resources has led to chronic shortages among Palestinian communities in Area C and a dependence on Mekorot … Mekorot supplies almost half the water consumed by Palestinian communities. The UNHRC also reported that Palestinians do not have access to the cheaper ‘recycled water’ available to Israeli settlements, and have to buy more expensive drinking water even for irrigation purposes. This injustice and inequity of access to water supply has always been a source of tension, especially when Palestinian villagers see water pipes leading to Israeli colonies passing through their land without supplying their village with water – as reported above at Sussia. “The Mission heard of situations where villagers must travel several kilometres to get water when closer water resources serve neighbouring settlements”, reported UNHRC. And even when they do get water, they receive second class treatment. “In the event of a water shortage, valves supplying Palestinian communities are turned off; this does not happen for settlements. Mekorot violates international law and colludes in resource grabbing -including pillaging water resources in Palestine. It supplies this pillaged water to illegal Israeli settlements, and engages in systematic discrimination and denial of water to the Palestinian population. For this reason Palestinian organizations including PENGON / Friends of the Earth Palestine have co-organised a ‘Stop Mekorot‘ week of action starting today, on World Water Day. The campaign aims to intensify pressure on governments and companies to boycott Mekorot and hold the company accountable for its discriminatory water policies and practices in Palestine. On March 20, the environmental federation Friends of the Earth International announced its support for the campaign against the discriminatory practices of Mekorot – joining the global call on governments, public and private utility companies and investors worldwide to avoid or terminate all contracts and cooperation agreements with Mekorot. Mekorot suffered another blow this week when authorities in Buenos Aires, Argentina, suspended a proposed $170m water treatment plant deal. The decision followed a campaign by local trade unions and human rights groups which highlighted Mekorot’s role in Israel’s theft of Palestinian water resources – and raised the prospect that Mekorot might export its discriminatory water policies to Argentina. Palestinians must have their rightful share of available resources and be granted full authority to manage them properly. Equitable and wise use of available resources among all people is the only basis for lasting peace in the region. And until then the deliberate, systematic, purposeful water discrimination and resource theft carried out in Occupied Palestine by the Occupation and Mekorot must be recognised for what they are – crimes against humanity. The perpetrators must be punished accordingly. Israel’s army radio reported on Wednesday that the US administration has offered to release the American who spied for Israel, Jonathan Pollard, in exchange for the 26 Palestinian prisoners initially scheduled for release in March, but only if Palestinian President Mahmoud Abbas agrees to extend the negotiations with Israel. The offer was proposed during Abbas’s recent visit to Washington. Western sources had earlier reported that officials in the US administration did not rule out releasing Pollard to encourage Israel’s Prime Minister Benjamin Netanyahu to release a fourth group of Palestinian prisoners and to push the stalled peace talks forward. The Palestinian and Israeli sides have not yet reacted to the news. US Secretary of State John Kerry is scheduled to arrive in the Jordanian capital Amman on Wednesday to meet with Abbas. The US arrested Pollard, a former analyst in the CIA and US Navy, for supplying Israel with thousands of secret documents revealing US involvement in spying on the Arab world, and sentenced him to life in prison in 1987. Israel was scheduled to release a fourth group of Palestinian prisoners consisting of 26 Israeli Arab prisoners at the end of March as part of last summer’s deal to re-launch peace talks with the Palestinians under US auspices. Commissioner General of the United Nations Relief and Works Agency (UNRWA) Filippo Grandi yesterday called on Israel and Egypt to lift the siege that has been imposed on the Gaza Strip for more than half a decade. Grandi said the siege on the Gaza Strip is considered the longest in history; longer than that of Sarajevo, Berlin and Leningrad. The UNRWA official acknowledged Israeli and Egyptian security concerns but insisted that the plight of about 1.8 million residents in the Strip also needs to be considered. He said that the Rafah Crossing has been closed for the seventh consecutive week and it is necessary to remind Egypt of its obligations towards patients and students who are in desperate need to travel. Grandi called the Israeli blockade on Gaza “illegal and [it] must be lifted”. He said that there are infrastructure projects run by the UNRWA worth $150 million. These projects are suspended until Israel lifts the siege, further harming the Palestinians. “I also want to make a strong appeal for export to resume because the lack of export is the main reason for the poverty of Gaza,” Grandi said. The official, who is leaving his office next week, said that the Gaza Strip has been suffering from a dangerous water problem, citing data mentioned in the UN 2020 report. MOSCOW – A ruling by a Ukrainian court to suspend broadcasts of four Russian TV channels in Ukraine is an attack against human rights and media freedom, a senior Russian diplomat said on Tuesday. The District Administrative Court in Kiev ruled to suspend broadcasts of Russia’s Rossiya 24, Channel One, RTR Planeta, and NTV-World in Ukraine pending hearings on a permanent ban. “Undoubtedly, this should be viewed only as an infringement on democratic freedoms and as a violation of Ukraine’s international obligations. Certainly, millions of [Russian-speaking] residents of this country have the right to watch [Russian] TV and have access to [other] Russian-language media,” said Konstantin Dolgov, the Russian foreign ministry’s point man on human rights. “Forces that came into power in Kiev as a result of an anti-constitutional coup, have declared their commitment to basic human rights and freedoms, to principles of democracy. Naturally, this announcement contradicts such statements,” Dolgov said. Ukraine is split into Russian-speaking east and Ukrainian-speaking west. National Television and Radio Broadcasting Council of Ukraine has ordered cable and satellite TV service providers to exclude Russian TV channels, popular among Russian speakers in eastern Ukraine, from their packages. The watchdog said the Russian channels’ coverage of the recent events in Ukraine, including the political crisis and Crimea’s reunification with Russia, harms national security. 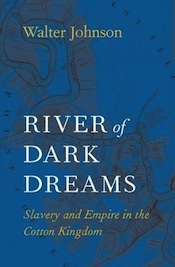 Historian Walter Johnson’s highly recommended book, “River of Dark Dreams,” centers on cotton production and slave ownership in the Mississippi River Valley prior to the U.S. Civil War. Planters, it seems, believed their fate was linked to imperatives imposed through an internationalized system of sales, manufacture, and re-supply. Johnson’s spirited, enthralling narrative casts slave ownership and cotton growing as precarious undertakings. Planters on the edge of disaster strategized and improvised in order to retain both land and slaves. Their intransigence vis-à-vis northern compatriots derived, Johnson suggests, from immersion in a labyrinth-like alternative universe that set conditions for their economic survival. Planters were alienated enough from pretensions of their own government to seek deliverance through privatized military interventions in countries seen as hospitable to plantations and slavery. Johnson focuses on actualities and people’s lives rather than on well-trodden slavery-era themes like abolitionism, or northern industrialization, or states rights . Social and economic history in his hands tells of ledger books; cotton “pickability;” slaves starving, stolen, rebelling, and running away; search dogs; slave babies dying, slave prices, soil fertility, droughts, sandbars, and Haiti. Steamboats feature prominently, along with their explosions, gamblers, races, high-pressure engines, and dining room etiquette. They were technological marvels of their era and absolutely crucial for marketing cotton. In New York southern cotton was re-sold, re-graded, and re-loaded onto other ships for the Atlantic crossing. That city consumed 40 percent of all income generated through cotton sales. Cotton made up two thirds of all U.S. exports. Yet only 10 percent of U.S. imports ended up in cotton-producing states. Southern manufacturers lacked essential equipment manufactured abroad. Cotton producers endured shortages of imported plantations supplies. Johnson characterizes “the conceptual reach of the global economy in the first half of the nineteenth century” as “lashes into labor into bales into dollars into pounds sterling.” Cotton moved from plantations, to factors in New Orleans, to bankers and shippers in New York, to bankers, buyers, and manufacturers in England, all on a flood of promissory notes, loans, credit, and deductions. “[F]or many in the Mississippi Valley … the most important issue in the early 1850s was Cuba.” Pursing annexation, former Spanish soldier Narciso López in 1851 invaded the island with troops drawn from “the margins of the cotton economy.” Slaveholders had donated supplies. The expedition failed, and López’ execution in Havana attracted 20,000 spectators. Former Mississippi governor and co-conspirator John Quitman raised 1000 men in 1855 for another invasion, which never materialized. Johnson reviews the career also of slaveholder proxy William Walker whose small army in 1855 subdued Nicaraguan defenders and set him up as the country’s president. Mississippi Valley supporters provided supplies, arms, troops, and ample publicity.